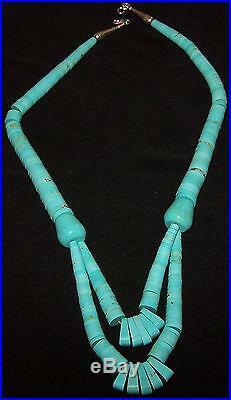 STUNNING LONG ESTATE BLUE TURQUOISE STERLING SILVER HEISHI NECKLACE, 21. INSIDE CIRCUMFERENCE and GAP LENGTH if a CUFF. Unmarked, acid tests as sterling silver. 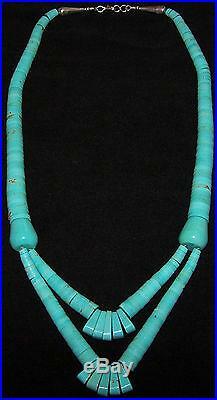 Beautiful graduated turquoise disk Heishi necklace. There is a little slack on the string that allows natural movement of the disks. 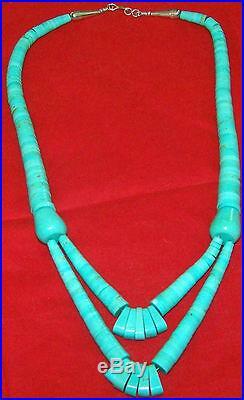 This amazing turquoise heishi necklace came from an estate down the memory lane. And we list new items frequently, so please save us in your favorites. NB: Display items are not always life size/to scale and are not included in the sale. A statement piece for someone special or for your own collection! These are estate sale pieces, so we do not always know the carat or clarity. The stone colors may look different and/or the shades appear darker or lighter in real life. 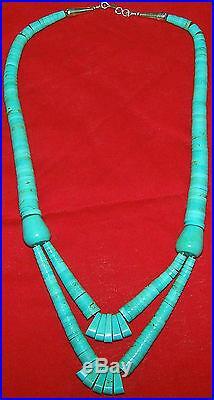 The item "STUNNING LONG ESTATE BLUE TURQUOISE STERLING SILVER HEISHI NECKLACE, 21.5" is in sale since Sunday, July 15, 2012. This item is in the category "Jewelry & Watches\Vintage & Antique Jewelry\Fine\Retro, Vintage 1930s-1980s\Necklaces & Pendants". 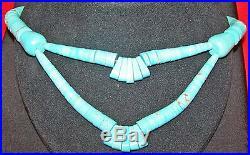 The seller is "thememorylanestore" and is located in Sunny California. This item can be shipped worldwide.